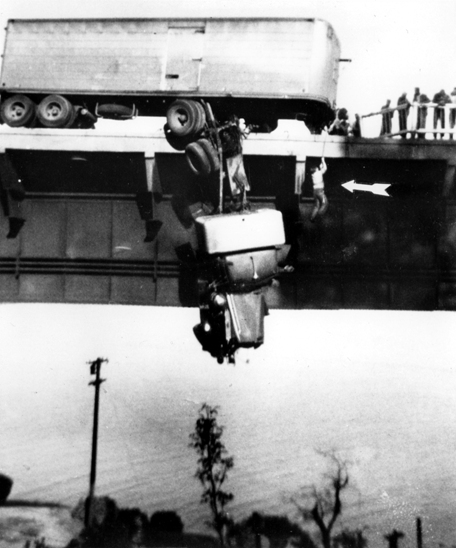 Virginia Schau’s 1953 photograph of the rescue of two truck drivers won her the Pulitzer in 1954, the first time that a woman won the award and the second time for an amateur. Journalism, photography and the breaking of news are today vastly different from the world of 1953. The growth of the internet, the ability to instantaneously post photographs and images on various sites and in various formats including Twitter, Facebook, personal blogs and You Tube, has led to the rise of what is sometimes called Citizen Journalism. No longer is the dissemination of news left to traditional journalists; the public themselves can now publish updates of breaking news. Virginia and her husband Walter were on a fishing trip in California when, travelling behind a large truck, they saw it plunge off a bridge at Redding. The truck had crashed through the railing after the steering mechanism had snapped. 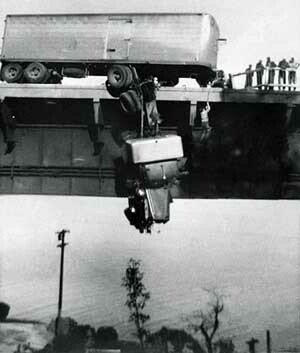 Running to the edge, they saw the prime mover of the semitrailer dangling over the edge, the driver and co-driver still inside. Walter and Virginia yelled for a rope, the driver behind their car fortunately had a long marine rope. Waler lowered it to the cabin and one of the men was pulled onto the bridge. As the second man was pulled up the prime mover burst into flames and crashed onto the rocks below. During the rescue, Virginia remembered that the Sacramento Bee awarded a $10 prize for the best news photograph of the week. 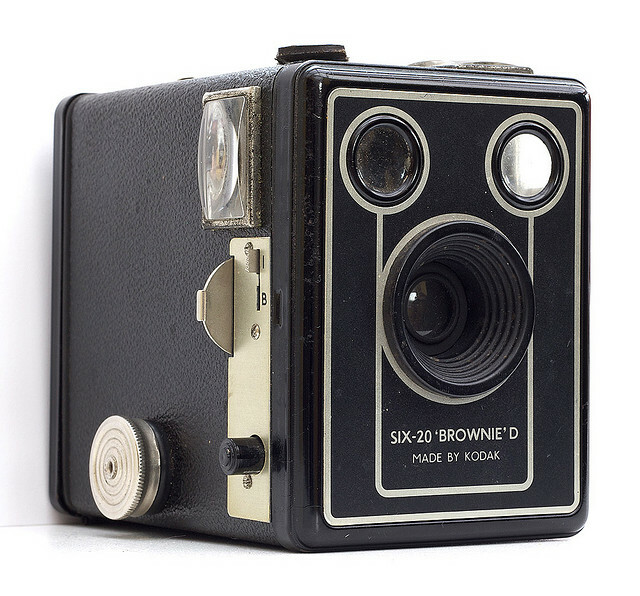 Going back to her car, she grabbed her camera from among the fishing gear, a simple Brownie Box camera that was the iPod of its day. She had two shots left on a roll of film that was one year past its use by date. Running to a vantage point across from the bridge, Virginia Schau took two shots of the rescue. Virginia won the $10 from the Sacramento Bee and the Pulitzer the following year. 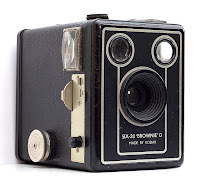 Virginia Schau’s photograph is one of the earliest instances of citizen journalism. Having no journalistic experience and no specialised photographic equipment, she happened to be in the right spot at the right time. I will let you know when I hear about my Pulitzer for 2013. What is interesting about the pic is the number of cops and police cars that attended. There were about half a dozen cars and about 20 police officers in all that suddenly appeared out of the proverbial nowhere. They should have referred to Rule #1, above.